17과 여기 주문 좀 받으세요. 나... 날씨가 쌀쌀한데 뜨거운 설렁탕을 먹을까요? 가... 좋아요. 여보세요. 여기 주문 좀 받으세요. 설렁탕 둘 주세요. 다... 미안합니다. 설렁탕은 지금 안 되는데요. 갈비탕이나 비빔밥은 돼요. 나... 그러지요. 나도 철스 씨와 같은 것으로 하겠어요. 아주머니, 깍두기도 많이 갖다 주세요. Note: right-click on the food name to open a new tab to see its corresponding picture. 2. N이/가 되다 : Can ... have N? Can we get Noengmyeon quickly? - I am sorry, it can't be prepared quickly. 어머니나 아버지 계시면 좀 바귀 주세요. Can I speak to your mother or father? 영어나 일본어를 할 줄 알아요? Do you know how to speak English or Japanese? 시간이 남으니까 책이나 신문을 읽겠어요. I will read book or newpapers since I have time. - I will have bulgogi. - I will have coffee. I feel really frustrated to take a bus. Let's order quickly since we are hungry. I ordered cold noodle and bulgogi. 7. 주문(을) 하다/받다 : to make/to take an order. Excuse me. Please take our order. 잠깐만 가디리세요. 곧 주문을 받겠습니다. Please wait a minute. I will take your order soon. 8. 소개 하다/받다 : to introduce/ to be introduced. 나는 새 친구를 소개 받았어요. I was introduced to a new friend. 9. 초대 하다/받다 : to invite/ to be invited. 나는 선생님 댁에 초대를 받았어요. I was invited to my teacher's house. 뜨거운 커피 - hot coffee. The kimchi soup is very hot. 찬 물 한 잔 갖다 주세요. 11. N1에게 N2을/를 갖다 주다 : to bring N2 to N1. 맥주 좀 빨리 갖다 주세요. Please bring us the beer quickly. Unit 17: Please take our order. A... Oh, it's already 1 o'clock. I am starving. Let's order quickly. B... 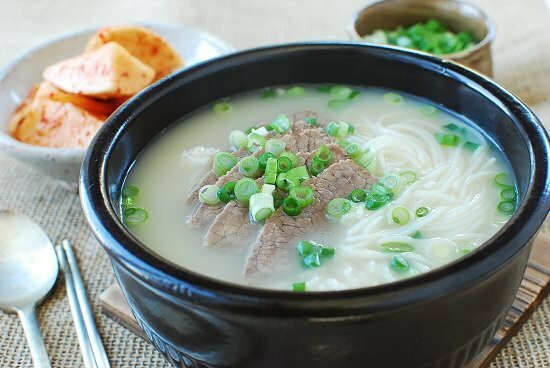 It's cold, so shall we eat seollongtang? A... Good. Excuse me. Please take our order. Two seollongtang, please. C... I'm sorry, but there is no seollongtang now. You can have galbitang or bibimbap. A... Then, shall we have galbitang. B... Okey, I will have the same thing that you are having. Please also bring a lot of kkakduki.